We’ve all been in them, namely situations where you simply can’t win. It’s like choosing a place to go for lunch after church on Sunday – somebody in the family invariably won’t be happy with where you end up. President Donald Trump probably wishes the dilemma he faces this week were as simple as selecting between Panda Express and Chipotle for the post-worship meal as the nation moves towards his “100 Days” mark on Saturday. The media always attaches an outsized importance to the artificial cutoff date as though a president would be expected to accomplish everything he set out to do in a little over three months. No chief executive has ever lived up to the standard, but seeing as this time it’s every journalist’s favorite kicking boy – Donald Trump – the talkers are in an especially frenzied mood attempting to make the case that the country’s first true “outsider” president badly flubbed his opening act. Trump on Friday downplayed the chatter, correctly labeling the “100 Days” as an impossible standard. Failures? First among the “failures” Nelson listed was the congressional GOP’s inability to agree on an Obamacare repeal and replace bill. The administration itself suggested a new version could be introduced as early as this week, most likely in an attempt to get it voted on before the “100 Days” expire. Maybe that was the plan all along…to put it off until now to give solving the issue a “dramatic” flare and therefore thwart the media narrative. They are politicians, right? The Politico writer also indicated the halting of the President’s “travel ban” executive orders was a misstep, as if there’s anything humanly possible that can be done from the Oval Office to prevent leftist ideologue federal judges from issuing stays for political reasons that defy common sense and the Constitution. Oddly enough, Nelson does seem to pass along begrudging credit to Trump for some of his foreign policy moves, most notably the president’s apparent warming relations with China and his get-tough approach to the Russians in Syria and the “mother of all bombs” that was dropped on ISIS caves in Afghanistan without any civilian casualties. I suppose media members had to give Trump a token bit of recognition to soften up the ground for this week’s all-out assault on his domestic agenda. From the surface it doesn’t look like much has been accomplished in the past thirteen weeks as Congress has been singularly focused on healthcare, passing over a dozen measures under the Congressional Review Act (see below) and in the Senate, pressing the “nuclear option” button while confirming Justice Neil Gorsuch. The media will certainly make hay over the fact Trump hasn’t yet addressed a number of the major items on his “100-day Action Plan to Make America Great Again,” but anyone who possesses even rudimentary knowledge of the way Washington works knows such a plan was ambitious to say the least. Trump the candidate ran last year on the promise of coming to the White House and first, undoing as much of the Obama damage as he personally could achieve under his presidential authority and then two, pledging to push Congress hard to act on a plan to get America’s economy going again so people could start working and living better lives again. There’s little doubt Trump has been a resounding success on point one. His string of executive orders (34 in all) served notice that things would be different under his leadership on topics such as energy production, trade, immigration and government reform, among other things. These aren’t exactly the type of headlining “achievements” reporters gush over. Instead the media has fixated on distractions such as Trump’s early March tweets where the president accused predecessor Obama of wiretapping his campaign’s phones, an allegation that isn’t technically accurate but also contains a great deal of truth. One action item that barely registered in the major newspapers and liberal cable TV shows was Trump’s early move to reinstate the Mexico City Policy which bars the federal government from paying for abortions in foreign countries. The president also revived the moribund Keystone pipeline project that almost certainly would have withered under a Hillary Clinton presidency. In other words, there’s been plenty of positive benefits from having Trump’s “phone and pen” in the White House. There’s been significant and measureable savings for taxpayers, too. Tim Devaney of The Hill reports, “President Trump has saved taxpayers more than $86 billion in regulatory costs during his first three months in the White House, according to a new study from a conservative group (The American Action Forum). There’s little question Congress can and should do more to get going on the president’s agenda. Speaker Paul Ryan requires more than a little prodding to step off the establishment stump and as has been amply demonstrated by the past three months, the Democrats will use every procedural obstruction in the rules to stall as long as permissible in the Senate. There are signs there will be new progress on the previously mentioned healthcare issue this week, but also on the much anticipated tax reform initiative. It’s important to remember it took years for the government to get where it is today and it’s going to take well beyond 100 days to approach a lot of these topics. 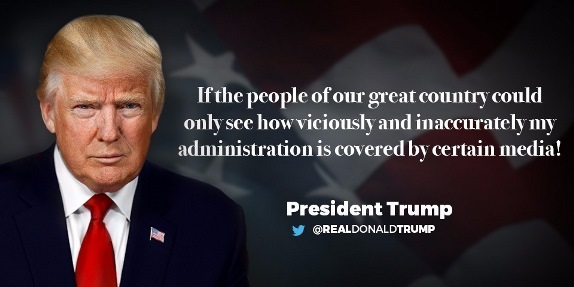 Tell that to the liberal journalists. The truth is, many of the media’s “100 Days” stories could have been written before Trump even took the oath of office. All they would have had to do was write an article with “failure” in the headline and then fill in the blanks. Even if the GOP’s Obamacare fix would have passed they would have found another issue where there was little progress. There’s still much left to do…but so far, Trump has a pretty good start at making America great again. If Congress doesn’t increase defense spending, should Trump take the blame? One shining example of an area where every president is somewhat powerless to make a difference is in pushing Congress to do its job in the appropriations process. Congress raises the revenues and is responsible for saying where the money should go…but our elected representatives simply haven’t been doing it, instead choosing to lump everything into one huge “omnibus” bill that incorporates everything and pleases no one. With all the attention and focus being devoted to the impending Trump “100 Days” mark the media almost seems to have forgotten about the looming budget deadline this week. The government will officially run out of money on Friday, which could trigger a government shutdown. Lost in the melee of blame could be President Trump’s promise to boost defense spending. Travis J. Tritten of the Washington Examiner reports, “A $578 billion bill that funds the Pentagon through September and provides some modest increases has already been hammered out by lawmakers in both chambers and passed by the House. While there is talk of a week-long extension before the big bill is passed, the main bill is likely to be the basis of all defense spending for the rest of the fiscal year. An omnibus bill allows Congress to shirk its duty of actually having to manage the government’s nickels and dimes down to the last penny. Because there isn’t time or opportunity to greatly alter the yearly appropriations, Trump’s request for supplemental funding is most likely going to go unheeded. The media will probably pick up on this as another “failure” in Trump’s first 100 days, but what is he supposed to do, walk down to Capitol Hill and attempt to personally draw up the legislation himself? In looking at the numbers, it all seems like monopoly money. 2 billion here, 5 billion there, 30 billion total…but the military needs (fill in the blank) billion for projects x, y and z. Nobody disputes the elite American military needs a lot of dough to fulfill its mission as the guardian of United States interests and it requires the best weapons, technologies and trained troops to accomplish it. But when we’re talking about busting budget caps and needing Democrat votes to do it – which will only be “bought” with more domestic spending – isn’t the larger picture being blurred here? If there is any “failure” in Trump’s initial time in office it’s due to Republicans completely abandoning the concept of fiscal discipline in favor of calling for more spending across the board. Only the House Freedom Caucus appears to care about the federal budget deficit anymore. Certainly the defense hawks who want to shovel dollars at every military project don’t appear concerned about what they’re doing to the big picture. With a potential shutdown on the horizon this week the topic of budgeting will come up. Politicians from both sides will pontificate about “priorities” and plenty of accusations will be exchanged. Democrats will claim the poor will be hurt by the Republicans’ proposal to cut the budgets of several federal departments; Republicans will counter with Democrats’ lack of worry over military readiness. Nothing will be accomplished and Trump will be caught taking a good portion of the fault for something he can’t control. If President Trump is to truly make a lasting impact on the direction of the country it may come through insisting Congress send him appropriations bills to sign in regular order. You know, just like the good ‘ol days. In the coming days and weeks there will be a lot of dialogue on whether President Donald Trump is gaining or losing support for his agenda. Congress will play a bigger role in the discussion as the nation’s representatives take up the big topics where a change in direction could make a noticeable impact on day-to-day lives, such as with tax reform. Regardless, political pundits will look to the polls to prove or disprove their point-of-view. Rebecca Savransky of The Hill reports, “President Trump has a historically low approval rating, according to a new poll, but nearly all of those who supported him in the November election say it was the right thing to do. “An ABC News/Washington Post poll finds that as the president approaches his first 100 days in office, just 42 percent of Americans say they approve of the job he is doing, compared to 53 percent who disapprove. That’s right – only two out of a hundred who pulled the lever for Trump last year are sorry for doing so. That’s an astonishing figure considering the unrelenting media drumbeat of negativity towards the president. The Democrats have also made numerous doomsday predictions about Trump that haven’t come true, perhaps the most laughable being that people will abandon him for nominating Justice Neil Gorsuch to the Supreme Court. The poll results also included the usual digs at the president…that he lacks the temperament for the office and he hasn’t accomplished much in his first 100 days. Ho hum. If the media could have written their “Trump was a failure in his first 100 days” stories even before he entered the White House they could have just as easily put together pre-done articles on the polls, too. Lost among the gloomy narrative of the poll numbers is the fact nearly all of Trump’s voters are still onboard with him. These people see a man who’s perhaps a little rough around the edges when it comes to excelling at politics but is also trying hard to change the culture in Washington -- one that doesn’t accomplish anything. People who are paying attention know what’s going on. The politics of the 2016 election haven’t shifted. The fight will continue. Time will tell which side prevails. It will require a leader like Trump to truly tip the balance.